Received November 6, 2018; Revised November 7, 2018; Accepted November 7, 2018. Rice is the staple food of more than 50% of the world population. Cultivated rice has the AA genome (diploid, 2n = 24) and small genome size of only 430 megabase (haploid genome). As the sequencing of rice genome was completed by the International Rice Genome Sequencing Project (IRGSP), many researchers in the world have been working to explore the gene function on rice genome. Insertional mutagenesis has been a powerful strategy for assessing gene function. In maize, well characterized transposable elements have traditionally been used to clone genes for which only phenotypic information is available. In rice endogenous mobile elements such as MITE and Tos have been used to generate gene-tagged populations. To date T-DNA and maize transposable element systems have been utilized as main insertional mutagens in rice. The Ac/Ds system offers the advantage of generating new mutants by secondary transposition from a single tagged gene. To enhance the efficiency of gene detection, advanced gene-tagging systems (i.e. activation, gene or enhancer trap) have been employed for functional genomic studies in rice. Internationally, there have been many projects to develop large scales of insertional mutagenized populations and databases of insertion sites has been established. Ultimate goals of these projects are to supply genetic materials and informations essential for functional analysis of rice genes and for breeding using agronomically important genes. In this report, we summarize the current status of Ac/Ds-mediated gene tagging systems that has been conducted by collaborative works in Korea. Rice is one of important plants in the world; in particular, it is the plant of high utility mostly consumed in Asian countries. Currently, owing to its flavor and nutrients contained therein, the level of consumption in global countries is increasing. Besides, due to the advantage of comparatively smaller size of its genome of 430 Mb, it has been employed as a model plant since the time of completion of complete analysis on sequence listing in its genome for the first time among monocotyledon plants (Feng et al. 2002). To develop crops with excellent qualities, securing excellent genes and its analyses are essential, and as a database of basic data required for studies thereof, the development of genetic map and quantitative analyses on characters thereof have been carried out so far. For the case of Arabidopsis thaliana, the profiles of genes to be manifested under specific conditions and selection of variant by T-DNA are being explored by using micro-array and gene knock-out as well as the studies on proteomics and micro-array and cultivation of variant group by using dSpm, the transposon. In analyses of the genome of corn, focuses are concentrating on exploration of functional genes through transposon tagging by the use of transposon, that is, the Mu (Mutator), Spm (Suppressor/mutator), and Ac (Activator) family (Greenblatt 1984; Dooner and Belachew 1989; Dooner et al. 1991). The full genome sequencing of rice has completed thereby efforts of analyses of gene functions are concentrating on each gene. Among the methods employed for the analyses of these genetic functions, the studies on knock-out variant through inserted mutants and the studies on gene expression profiles using DNA chips are usefully available. For the case of rice, the retrotransposon (Tos17), (Miyao et al. 2003), exogenous genes Ac/Ds (Kolesnik et al. 2004), En/Spm-dSpm (Kumar et al. 2005) and T-DNA (Chin et al. 1999; Jeon et al. 2000; Kim et al. 2004) insertional mutagenesis have been created. By using mPing, the gene destruction as well as control of the area and time of gene expression can be available. In the present paper, recent trends in the analyses of insertional mutants of rice will be presented. The analysis of genes by employing reverse genetics became activated on completion of the identification of genes of plants (Parinov and Sundaresan 2000). For the case of A. thaliana, such information is now easily available from the database (http://signal.salk.edu/Source/AtTOME_Data_Source.html). In regard to rice, the large scaled group of mutants originated from Tos17 was constructed by exploiting the availability of the ways of making new variations by the transposition of retrotransposon into other gene or parts of gene during the process of tissue culture (Hirochika et al. 1996; Hirochika 1997), and the T-DNA tagging group was generated by utilizing the technology that enabled the cultivation of transformants by using the agrobacterium; and the group of insertional mutagens comprising over 100,000 lines based on Dongjin Rice was constructed (Jeon et al. 2000; Jeong et al. 2002), and 30,000 families based on Nipponbare were also developed (Wu et al. 2003) which have been exploited for studies on functional genomics of rice. In addition, the groups of insertional mutagenesis were also cultivated by using the transposon of corn; one of them was resulted from the employment of Ac/Ds (Chin et al. 1999; Upadhyaya et al. 2002; Greco et al. 2003; Kolesnik et al. 2004), whereas the other was resulted from an employment of En/Spm-dSpm these were reported as 70% of the insertional mutagens were inserted into genes of rice (Greco et al. 2004; Kumar et al. 2005). The Ac/Ds system based on frame shift is an important method for mutant breeding system in that it can be exploited to find new gene locus by the second order transition from single tagged gene. Large amount of Ds-tagging group triggers transposition and can be created by selecting transposable element; this series of events can be created through the crossover of strains having transposable element and releasing factor and an attainment of the transformation by using seed-derived callus of the strains (Kim et al. 2004). Besides, Jiang et al. (2007a) created 20,000 strains of Ds insertional mutants of rice by using Ac/Ds transposable element of corn. In Korea, the Ds insertional mutants of 100,000 lines have already created until 2007 and have been exploited for the analyses of genetic functions (Park et al. 2007a). Over 200,000 flanking sequence tags (FST) held by knock-out mutants were analyzed from which approximately 50% thereof were predicted to encode protein; these results suggest the Ds insertional mutant lines would be a useful large scaled group applicable to plant breeding (Krishnan et al. 2009). Krishnan et al. (2009) analyzed 206,668 insertional FST and summarized the results of analyses wherein 180,639 FST were found with an agreement by single repetition on the genome of rice with specificities to corresponding insertional mutants varied according to different kinds of insertional mutagens from which the Tos17 was reported it was inserted in the highest ratio (Fig. 1). Details of Ds insertional mutant excerpted from the summary are presented in Table 1. The 115,000 Ds insertional mutants were constructed by using the Ac/Ds gene trap system through the Crop Functional Genomics Program in Korea wherein the 462 mutants, among 12,162 Ds strains, were distinguished and analyzed. The position of Ds insertion was analyzed through the analysis of FST from which the transposition of Ds mainly to the #3 chromosome, as well as to the #1 and #4 chromosomes in the ratio more than other genes, was identified due to the employment of the starter line (Ds3 and Ds43) having Ds at the #3 chromosome despite the transposition occurred over entire chromosomes (Fig. 2). The four phenotypic variations of agronomic characters such as culm length, ear length, panicle number per hill, and heading date of the group of cultivated Ds mutants were analyzed and the agronomic characters, varied from the original species of the Dongjin Rice, were reported to have been distributing by following normal distributions of respective parameters; besides, the varieties such as internode elongation, floral structure, seed size (Fig. 3), leaf color, and variation in leaf form (chlorophyll deficiency, drooping leaf, spotted leaf, brittle culm and etc.) were examined and acquired. Ahn et al. (2008) analyzed Southern blot of Ds group and found average 2 copies of Ds transferred on the genome of rice and also found approximately 3.9% of the expression of GUS on each part of tissues of leaf, root, floral organ and etc. together with a lot of morphological variants such as twin seedling, dwarf, early heading, strip albino, and liguless as well as agronomically useful variants; these suggest the Ds group would be the useful one for breeding purposes and functional analysis of genes. Genetic identification of rice by using insertional mutagens was initiated by the use of the group of Tos17 wherein the prospective genetic approach was employed for the identification of viviparous genes (Agrawal et al. 2001) and the retrospective approach was used to identify the phytochrome A genes (Takano et al. 2001). For the analyses of genetic function by using T-DNA, the prospective genetic methods employed for the analysis of genes associated with abnormal variation of chlorophyll (Jung et al. 2003) and the retrospective methods employed for the analysis of genetic functions through screening of MADS-box genes based on PCR (Lee et al. 2003), were used. Besides, the expression-based GT screening was used to analyze genetic functions associated with the white core mutation of rice (Kang et al. 2005). The branched floretless 1 (bfl1) which has defects in floral structure and ear of rice was found from the group of insertional mutagens and was reported as it would be located on the seventh chromosome of rice and be the genetic locus of frizzy panicle which was reported previously (Zhu et al. 2003), and further, the dwarf Ds insertional mutant of rice was searched for and the FST thereof was analyzed from which it was identified as the ent-kaurene synthase (KS) gene being situated in the second stage of GA biosynthetic pathway located on the 4th chromosome thereby the OsKS1 was reported as irrelevant to the germination and growth of root of rice (Margis-Pinheiro et al. 2005); this eventually initiated the genetic identification and analysis on functions of genes of rice by using the group of Ds insertional mutants. The Ds was identified as inserted into gene of the group of Myosin XI through the FST analysis of selected mutants that expressed in the pollen of rice by the GUS gene to which the Ds was inserted and expressed infertile phenotype; this was the first myosin variant found from the monocotyledonous plant. The variant was identified as the OSMYOXIB gene related with the growth of pollen under long-day condition and expressing male sterility under short-day condition; and the new phenotypic aspect such as the development of pollen by cell surface mechanism among mechanisms of gene expressions was reported through studies on these variants (Jiang et al. 2007b). Homeobox genes were used to find genes involved in growth and quantity of plants by identifying phenotypic aspects of corresponding genes in the studies of genes involved in generation of leaf and development of organs wherein the genes act as transcription factors and control the differentiation of stem cells at the growing point. The OSH6 gene, the homeobox gene of rice, is similar to Lg3 (Liguless3) involved in the development of leaf of corn. The plants of the over-expression of both OSH6 and Lg3 show identical phenotypes of leaf, the ‘blade to sheath transformation’. The new OSH6-Ds, selected from the group of Ac/Ds transposable element insertional mutants of rice by using the transposable element of corn, forms an mRNA of a form cut by the Ds inserted into the third exon and be specifically expressed in the leaf as well as the expressions in the growing points of stem and flower which are the phenotypic aspects of normal OSH6 gene. The OSH6-Ds of new character shows an abnormally developed phenotype of bract leaf at the part of cut flower stalk; for the case of normal plants, the bract is known as degenerated organ. The transformant of over expressed OSH6-Ds was established and the phenotype was observed to identify the formation of phenotypic changes by the genetic character newly formed from which the phenotype of flower stalk identical to the OSH6-Ds variant was found; the formation of new genetic character by the insertion of transfer factor and the appearance of new function through interaction with the normal gene (OFH6) was identified through the specific phenotypic aspects (Park et al. 2007b). The gene, involved in the development of root hair of rice, affects the growth of plant significantly. This also affects the harvest of rice directly thus, the OsCSLD1, the gene directly involves in the growth of root hair of rice, was identified and analyzed from the group transferred into rice by the use of Ac/Ds to identify the mechanism of development of root hair. The gene, knocked-out by an insertion of Ds, inhibits the growth of root hair significantly resulting in significant inhibition of the growth of plant. To verify this causality, the over expressed plant body was induced and the revertant plant body was developed through re-differentiation to identify the formation of root hair and the resulted mechanism of the development of root hair was reported (Kim et al. 2007). The mutant population, raised for purposes of the analysis of functional genomics, reproduces unintended variants by the transference of diverse transposons existing in genome of rice through tissue culture; the resulted variants disturb studies on functional genomics by decreasing the ratio of relatedness with the morphological phenotypic variation. The group of Ds insertional mutants exhibits relatively lower ratio of unintended variants of transposable element that enables genetic analysis and utilization of plural variants of genes thereby also enables the screening of diseases and environment using prospective genetic approaches and is used as useful materials to identify the relationship between gene and phenotype through the method enabling restoration of the phenotype of parents (Zhu et al. 2007). Besides, as a way of studies delving into methods enabling productivity increase through molecular breeding method, the OsId1, the pseudo-gene of rice of Id1 (Indeterminate 1), was identified to clarify phased mechanisms in the period of the formation of floral mechanisms through the study on genes involved in development period of pollen by which the studies on phenotypic mechanism of genes and functions of genes through RNAi technique were carried out. The development of floral mechanism was inhibited by the suppression of manifestation of OsId1 gene regardless of the conditions of long-day or short-day; this was concluded to be ascribable to the control of the manifestation of genes such as early heading date 1, Hda3a, RFT1 and etc. which are involving in the development of floral organ. In addition, the control of such genes was identified as a new control mechanism for the development of floral organ different from the existing control mechanisms by the genes of OsGL and OsMADS thereby the increased manifestation of Ehd1 by OsId1 was thus identified as it promotes the development of floral organ (Park et al. 2008). Regardless of conditions of long-day or short-day, the identification of genes controlling floral development is a good material for the molecular breeding as well as the improvement of crops in the discipline of classical breeding. If the floral development is controlled solely by manifestation of genes and became comparatively independent on day length, it can be exploited as a material suitable for the parents for molecular breeding capable of mass cultivation of highly functional protein originated from crops. Several databases are available for the identification of genetic functions and analysis of genes by using FST information of Ds insertional mutagens. These databases basically provide users with FST information as well as phenotypic information for future studies on the phenome (Table 1). 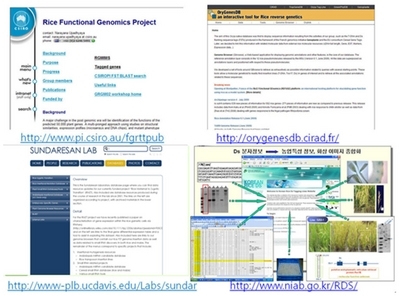 The Rice Functional Genomics Project (RFGP) run by Commonwealth Scientific and Industrial Research Organism (CSIRO) in Australia provides users with the information of tagged gene (http://www.pi.csiro.au/fgrttpub), whereas the OryGenesDB run by EU-OSTID of EU provide users with Ds insertional mutagens as well as FST information of T-DNA (http://orygenesdb.cirad.fr/). The Sudaresan Group of UC Davis shares the achievements and information of functional genomics of rice and Arabidopsis thaliana in its web-page with brief introduction thereto and related links (http://www-plb.ucdavis.edu/Labs/sundar). In Korea (KRDD, http://www.niab.go.kr/RDS/), the information of 115,000 cultivated Ds insertional mutagens and characteristics thereof are provided (Fig. 4) wherein the analyzed FST information, phenotypic information, materials of Southern blot analyses, and GUS information are included. On completion of the analysis of genomic structure of rice, efforts in the era of post-genome are concentrating on functional analyses of genes. The genes, manifesting in rice, have been known manifesting in other crops; this has enabled researchers to separate useful genes there from through an exploitation of diverse bioengineering technologies. And as an efficient means of mass functional analysis of genes of rice, the mass cultivation of the families of insertional mutagens of rice of genes knocked out arbitrarily and the comparison of base sequence information and phenotypes of insertional mutants at the knock-out part of genes together with physiological characteristics of metabolism are used to analyze the functions of genes. For the functional analyses of genes of rice, diverse methods including the prospective genetic approaches as well as retrospective genetic approaches are employed for the cultivation of insertional mutagens. A total of 115,000 series of insertional mutagens were also cultivated domestically by using the Ds transfer factors and their FST were also analyzed thereby. Besides, the families, representing phenotypic variation, have been searched for and analyzed and the consequences there from are accumulated in the database. The plans to exploit the groups of vast insertional mutants efficiently shall be developed together with methods to identify and exploit characteristics of genes through the screenings of environmental tolerance and disease resistance. Contrasting to the average 40,000 genes of rice identified through the genetic information analysis, the number of phenotypic variations visually observable is limited, and further, the visually observable phenotypic variations also need progeny test to distinguish each variation from environmental variations. Further, the investigations of physiological characters showing continuing variations, variations associated with metabolism, and variations of subterranean part are quite difficult. Recent trends reflect the development of phenome databases wherein the relevance of inserted base sequences to phenotypic variations and the comprehensive analyses on variants thereof are integrated together to improve the efficiency of studies of functional genomics. Thus, the degree of exploitation of such databases of insertional mutagens is expected to be increasing for the analyses of phenomes. This work was carried out with a grant from the Next-Generation Biogreen 21 Program (Project No. PJ013696012018) and RDA Agenda Program (Project No. PJ0135622018). Fig. 1. Distribution of insertion positions within genic regions in rice (). Fig. 2. The number of Ds insertions on each of the 12 chromosomes from the 6,026 Ds elements. Fig. 3. Characteristics of different mutants from populations. zeb: zebra, v: verscent, alb: albino, chl: chlorine, pgl: pale green leaf, apl: spoteed leaf, la: lazy, at: stripe, dwf: dwarf. Fig. 4. Public Database related to Ds insertional mutants. 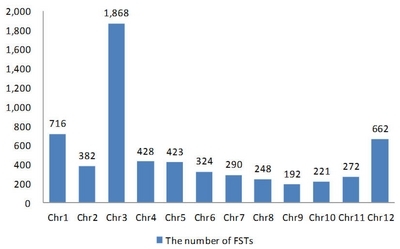 Summary of FST genes in rice according to the individual institute in the international Rice Functional Genomics Consortium (IRFGC) (Chandran et al. 2016). Indicates the total number of loci annotated by the rice genome annotation project team (version 7.0). Agrawal, GK, Yamazaki, M, Kobayashi, M, Hirochika, R, Miyao, A, and Hirochika, H (2001). Screening of the rice viviparous mutants generated by endogenous retrotransposon Tos 17 insertion. Tagging of a zeaxanthin epoxidase gene and a novel OsTATC gene. Plant Physiol. 125, 1248-1257. Ahn, BO, Kang, KH, Eun, MY, Jeon, YH, Yun, DW, and Ji, HS (2008). Trait variation and molecular characterization of Ds insertional rice lines. Korean J Breed Sci. 40, 39-47. Chandran, AKN, Lee, GS, Yoo, YH, Yoon, UH, Ahn, BO, and Yun, DW (2016). Functional classification of rice flanking sequence tagged genes using MapMan terms and global understanding on metabolic and regulatory pathways affected by dxr mutant having defects in light response. Rice. 9, 17. Chin, HG, Choe, MS, Lee, SH, Park, SH, Koo, JC, and Kim, NY (1999). Molecular analysis of rice plant harboring an Ac/Ds transposable element-mediated gene trapping system. Plant J. 19, 615-623. Dooner, HK, and Belachew, A (1989). Transpositional pattern of the maize element Ac from the bz-m2(Ac) allele. Genetics. 122, 447-457. Dooner, HK, Keller, J, Harper, E, and Ralston, E (1991). Variable patterns of transposition of maize element Activator in tobacco. Plant Cell. 3, 473-482. Feng, Q, Zhang, Y, Hao, P, Wang, S, Fu, G, and Huang, Y (2002). Sequence and analysis of rice chromosome 4. Nature. 420, 316-320. Greco, R, Ouwerkerk, PB, De Kam, RJ, Sallaud, C, Favalli, C, and Colombo, L (2003). Transpositional behavior of an Ac/Ds system for reverse genetics in rice. Theor Appl Genet. 108, 10-24. Greco, R, Ouwerkerk, PB, Taal, AJ, Sallaud, C, Guiderdoni, E, and Meijer, AH (2004). Transcription and somatic transposition of the maize En/Spm transposon system in rice. Mol. Genet. Genomics. 270, 514-523. Greenblatt, IM (1984). A chromosome replication pattern deduced from pericarp phenotypes resulting from movements of the transposable element, modulator, in maize. Genetics. 108, 471-485. Hirochika, H, Sugimoto, K, Otski, Y, Tsugawa, H, and Kanda, M (1996). Retro-transposons of rice involved in mutations induced by tissue culture. Proc Natl Acad Sci USA. 93, 7783-7788. Hirochika, H (1997). Retrotransposons of rice: their regulation and use for genome analysis. Plant Mol Biol. 35, 231-240. Jeon, JS, Lee, S, Jung, KH, Jun, SH, Jeong, DH, and Lee, J (2000). T-DNA insertional mutagenesis for functional genomics in rice. Plant J. 22, 561-570. Jeong, DH, An, S, Kang, HG, Moon, S, Han, JJ, and Park, S (2002). T-DNA insertional mutagenesis for activation tagging in rice. Plant Physiol. 130, 1636-1644. Jiang, SY, Bachman, D, La, H, Ma, Z, Venkatesh, PN, and Ramamoorthy, R (2007a). 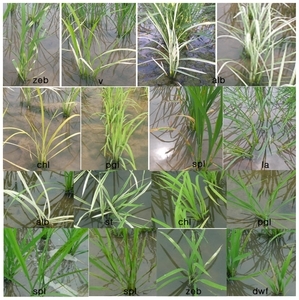 Ds insertion mutagenesis as an efficient tool to produce diverse variation for rice breeding. Plant Mol Biol. 65, 385-402. Jiang, SY, Cai, M, and Ramachandran, S (2007b). ORYZA SATIVA MYOSIN XI B controls pollen development by photoperiod-sensitive protein localizations. Dev Biol. 304, 579-592. Jung, KH, Hur, J, Ryu, CH, Choi, Y, Chung, YY, and Miyao, A (2003). Characterization of a rice chlorophyll-deficient mutant using the T-DNA gene-trap system. Plant Cell Physiol. 44, 463-472. Kang, HG, Park, S, Matsoka, M, and An, G (2005). White-core endosperm floury endosperm-4 in rice is generated by knockout mutation in the C-type pyruvate orthophosphate dikinase gene (OsPPDKB). Plant J. 42, 901-911. Kim, CM, Park, SH, Je, BI, Park, SH, Park, SJ, and Piao, HL (2007). OsCSLD1, a Cellulose Synthase-Like D1 gene, is required for root hair morphogenesis in rice. Plant Physiol. 143, 1220-1230. Kim, CM, Piao, HL, Park, SJ, Chon, NS, Je, BI, and Sun, B (2004). Rapid, large-scale generation of Ds transposant lines and analysis of the Ds insertion sites in rice. Plant J. 39, 252-263. Kolensik, T, Szeverenyi, I, Bachman, D, Kumar, CS, Jiang, S, and Ramamoorthy, R (2004). Establishing an efficient Ac/Ds tagging system in rice: large-scale analysis of Ds flanking sequences. Plant J. 37, 301-314. Krishnan, A, Guiderdoni, E, An, G, Hsing, YC, Han, CD, and Lee, MC (2009). Mutant resources in rice for functional genomics of the grasses. Plant Physiol. 149, 165-170. Kumar, CS, Wing, RA, and Sundaresan, V (2005). Efficient insertional mutagenesis in rice using the maze En/Spm elements. Plant J. 44, 879-892. Lee, S, Kim, J, Son, JS, Nam, J, Jeong, DH, and Lee, K (2003). Systemic reverse genetic screening of T-DNA tagged genes in rice for functional genomic analysis: MADS-box genes as a test case. Plant Cell Physiol. 44, 1403-1411. Margis-Pinheiro, M, Zhou, XR, Zhu, QH, Dennis, ES, and Upadhyaya, NM (2005). Isolation and characterization of a Ds-tagged rice (Oryza sativa L.) GA-responsive dwarf mutant detective in an early step of the gibberellin biosynthesis pathway. Plant Cell Rep. 23, 819-833. Miyao, A, Tanaka, K, Murata, K, Sawaki, H, Takeda, S, and Abe, K (2003). Target site specificity of the Tos 17 retrotransposon shows a preference for insertion within genes and against insertion in retrotransposon rich region of the genome. Plant Cell. 15, 1771-1780. Parinov, S, and Sundaresan, V (2000). Functional genomics in Arabidopsis: large-scale insertional mutagenesis complements the genome sequencing project. Curr Opin Biotechnol. 11, 157-161. Park, SH, Jun, NS, Kim, CM, Oh, TY, Huang, J, and Xuan, YH (2007a). Analysis of gene-trap Ds rice population in Korea. Plant Mol Biol. 65, 373-384. Park, SH, Kim, CM, Je, BI, Park, SH, Park, SJ, and Piao, HL (2007b). A Ds-insertion mutant of OSH6 (Oryza sativa Homeobox 6) exhibits outgrowth of vestigial leaf-like structures, bracts, in rice. Planta. 227, 1-12. Park, SJ, Kim, SL, Lee, S, Je, BI, Piao, HL, and Park, SH (2008). Rice Indeterminate 1 (Osld1) is necessary for the expression of Ehd1 (Early heading date 1) regardless of photoperiod. Plant J. 56, 1018-1029. Takano, M, Kanegae, H, Shinomura, T, Miyao, A, Hirochika, H, and Furuya, M (2001). Isolation and characterization of rice phytochrome A mutants. Plant Cell. 13, 521-534. Upadhyaya, NM, Zhou, XR, Ramm, K, Zhu, QH, Wu, L, and Eamens, A (2002). An iAc/Ds gene and enhancer trapping system for insertional mutagenesis in rice. Funct Plant Biol. 29, 547-559. Wu, C, Li, X, Yuan, W, Chen, G, Kilian, A, and Li, J (2003). Development of enhancer trap lines for functional analysis of the rice genome. Plant J. 35, 418-427. Zhu, QH, Hoque, MS, Dennis, ES, and Upadhyaya, NM (2003). Ds tagging of BRANCHED FLORETLESS 1 (BFL1) that mediates the transition from spikelet to floret meristem in rice (Oryza sativa L.). BMC Plant Biol. 3, 6.